With a milder spring, the show gardens positively oozed variety at the RHS Chelsea flower show this year with an array of colours from yellows and oranges to blues and purples and everything inbetween. There was an international flavour at the RHS Chelsea Flower Show this year with global gardens and many plants from around the world, all helping to make the show more interesting than ever before. I never realised the Dahlia for example is the national flower of Mexico! The RHS Great Pavilion was as wonderful as ever with a rainbow of colour, elegance and textures. On the whole a show full of positive feeling and energy. 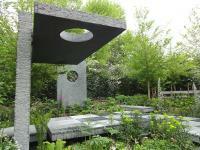 The RHS Great Chelsea Garden Challenge competition took place the week before Chelsea and was aired on BBC television. It showcased six amateur finalists creating different gardens and being judged on the four main criteria used by the RHS; theatre, design, delivery of formal brief and horticultural knowledge. It was interesting to see how a show garden is created from start to finish, with the designers selecting their plants at the nursery, working on hard landscaping, then planting and adding the final details to the completed garden. One passionate amateur garden designer, Sean Murray, was chosen to fulfil his dream to design a garden at RHS Chelsea. He created an environmentally friendly front garden for a couple nearing retirement. The design included off-street parking, a sculpture, a place to sit and landscaping to absorb water and support wildlife. This garden wasn’t judged, but was appreciated by everyone at the show and certainly added a new dimension to RHS Chelsea. Within the fifteen show gardens this year, the hard landscaping seemed to stand out and play an important role. Stone, rocks, dry stone walls, buildings, slabs and areas to sit and relax, all added to the diversity of the gardens. Seven show Gardens won gold, with my favourites being The Telegraph Garden, A perfumer’s Garden in Grasse, Cloudy Bay Garden, in association with Vital Earth and The Morgan Stanley Healthy Cities Garden. The Brewin Dolphin Garden was a wonderful garden that featured more than 40,000 pieces of hand cut slate to form the surface of suspended platforms which hovered above woodland edge plants. With plenty of height and volume and full of drama this garden was bold and screamed with energy. The Hidden Beauty of Kranji by Esmond and Uniseal, featured sheets of water cascading down amongst tropical plants and stunning orchids; an array of colour and unusual plants from a suburb in the far end of Singapore which transported people away on holiday. Manicured to a very high standard this garden won Silver-Gilt. The Laurent-Perrier Chatsworth Garden to me was more of a landscape than a garden, but maybe if I’d been able to walk through the garden I would have seen it differently. However, it won a gold award and Best Show Garden. An essence of Chatsworth brought to Chelsea. With 250 tonnes of Derbyshire rock, and the largest show garden on the triangular plot which could be viewed from all sides, it created a space which felt real, and brought a piece of landscape down from lovely Derbyshire. The small gardens were as exciting as the large show gardens. In the Fresh category two gardens were awarded gold, and four gold medals were awarded in the Artisan category. The small gardens drew you in, as you could get up close and really capture the feeling and atmosphere. The Fresh category gardens were innovative, using new technologies and materials and really let the imagination fly. This year I thought the Fresh Gardens stood out more and were easier to understand than in previous years. My favourite was The World Vision Garden, a conceptual garden all about rice and the place it plays in the economy and in the nutrition of millions of people across the developing world. This garden won Silver-Gilt. The Artisan category gardens were my favourite gardens. Small plots, showcasing traditional crafts, sometimes rural or with a rustic feel. They were stunning little sets. The Old Forge Garden, which told a story of a fictional blacksmith who developed Motor Neurone Disease and wasn’t able to work anymore, so the forge and the area around it fell into disrepair being reclaimed by nature. An abundance of wild flowers, foxgloves, cow parsley, poppies, cowslips and bee orchids made this a lovely colourful little garden, which won a silver medal. A Trugmaker’s Garden, celebrated the dying artisan craftsmanship of Sussex trugmakers, who have been making the iconic willow and sweet chestnut garden trugs for more than 200 years. The garden beautifully depicted a typical trugmaker's garden at the front of a traditional timber workshop. Its vibrant planting scheme was indicative of the garden’s past, as a means of attracting passing trade. The busy workshop was bursting with wood and the traditional trugmaker’s tools, which are still used today. This garden won a very well deserved gold award. The beating heart of the show was The Great Pavilion, with 58 gold awards handed out this year. With an explosion of colour, and all the plants labelled, it was a great place for anyone to come away with fresh new inspiration for their own gardens. Stalls layed out their glorious wares to an exceptional level. Birmingham City Council Celebrated 300 years of St Paul’s Cathedral and won the highest accolade of all with the Diamond Jubilee Award. My favourite display was the Interflora Time for Tea display. Twenty dramatic new plants were shortlisted for the RHS Chelsea Plant of the Year competition. Judged on innovation, excellence and overall appeal. In third place was Salvia ‘Love and Wishes’, second place Streptocarpus ‘Polka-Dot Purple’, and first place went to Viburnum plicatum f. tomentosum ‘Kilimanjaro Sunrise’. With the magnificent display of potatoes which also won gold, what will next year bring to the Great Pavilion? Plants that seemed to be making a huge come back were Hydrangeas, Fuchsias and Gladioli. It’s great that some of the show gardens were moving on to have another life after Chelsea and will bring pleasure to many more people for years to come. It would be great if the general public were able to walk through the show gardens, let’s hope the RHS seriously consider this for future years. Yet again Chelsea had the wow factor for me and loads of inspiration for my garden. Published on 25 May 2015 and Filed under Reviews.